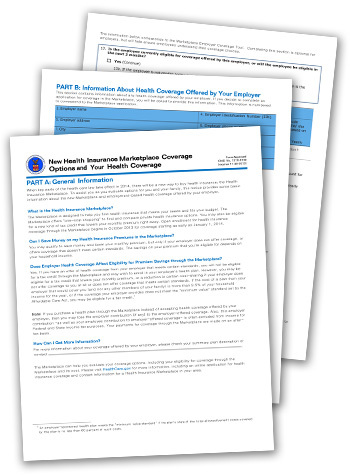 Under the Affordable Care Act (ACA), an employer subject to the Fair Labor Standards Act must provide a written notice to current employees about the Health Insurance Marketplace (the “Exchange Notice”) by October 1, 2013, and for those hired on or after October 1, within 14 days of the employee’s date of hire. Employers have been working hard to meet this deadline. On September 11, 2013, the U.S. Department of Labor unexpectedly announced that there will be no fine or penalty imposed on employers that fail to provide the Exchange Notice. The ACA generally imposes a $100-per-day penalty for noncompliance, and many had assumed that this penalty would apply to employers who fail to provide the Exchange Notice. Now, the Department of Labor has stated there will be no fine or penalty under the law for failing to provide the Exchange Notice, although it encourages compliance. While this is good news, we still encourage clients to send the Exchange Notice to current employees by October 1, if possible, so as to be compliant with applicable law.